The US is facing many challenges as it enters in 2011 from a growing deficit, to a costly war, and an obesity epidemic. Elliott Morss lays out 10 reasons why the US is an empire in decline. See the following article from The Street. A while back, I wrote an article on global empires. The British Empire was the largest in history as measured both by land area (13 million square miles) and population covered (531 million). As measured by share of GDP, the U.S. Empire was the largest: In 1945, its GDP was 35% of global GDP. Things have changed since then. Unlike Japan and China, the U.S. was at one time richly endowed with energy resources. Even today, it is the third leading producer of energy from oil, the second leading producer from coal, the second leading producer of energy from natural gas and by far the largest producer of nuclear energy. But because of its voracious energy consumption, the U.S. must supplement its own production of energy with imports. It now imports 63% of its crude oil, and this constitutes 21% of all crude oil traded globally. This is an extreme and dangerous dependency. The European countries and Japan have imposed heavy taxes on motor vehicle fuels so gas prices have been in the $6-$7 range for more than a decade. But the U.S. government policy has been able to keep the gas price as low as possible. The result? Per capita, the U.S. consumes almost four times as much oil as the other OECD countries. Is there a U.S. energy policy? Serious problems started in Vietnam: 55,000 Americans were lost, more than 2 million Vietnamese were killed, the U.S. pulled out and nothing was accomplished. The Cold War ended when the USSR economy collapsed. The Middle East: Most governments in the Middle East, with the exception of Israel, hate America. And not just a little hatred. This hatred led directly to a new terrorism era with suicide bombers, plane hijackings and 9/11. Foreign policy that creates such hatred is not good foreign policy. The hatred came not only because the U.S. helped establish the Israeli state. Rather, it resulted from the U.S. arming Israel to be its U.S. policeman in the Middle East. Israel used its power to occupy and seize lands from its neighbors. Of course, there were provocations. But Israel has been condemned by the UN Security Council for aggressive acts 29 times, far more than any other country in the history of the UN. To combat terrorism following 9/11, the U.S. started a land war in Afghanistan. It invaded Iraq and removed Saddam Hussein from power. Removing Saddam from power effectively gives Iraq to Iran. And does anyone think anything meaningful, aside from more deaths, will result from keeping troops in Afghanistan until 2014? The U.S. used to benefit from its immigrants. Being "the melting pot" was viewed favorably. Now there are more than 10 million illegal immigrants in the U.S. Rather than doing something about them, the U.S. tightens up on legal immigration rules so that now, universities like Harvard and MIT are having difficulties getting permits for their brightest foreign students to stay and work in the U.S. 10 million illegal workers are not going to be sent home. Each...living apart, was a stranger to all the rest -- his children and private friends constitute to him the whole of mankind; as for the rest of his fellow citizens, he is not close to them, and sees them not; he exists but in himself and for himself alone. 14% of new high school teachers leave by end of the first year, 33% within 3 years, and 50% by end of 5th year. This is not promising. 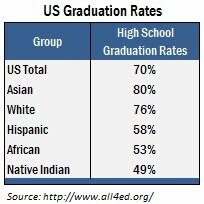 The ethnic breakdown on graduation rates is interesting. It is similar to the breakdown on test scores. There is much hand-wringing about the U.S. federal government deficit and how it will contribute further to U.S. debt. But in fact, government debt is not all that high relative to other countries. What is high is the debt of households. U.S. households owe $13.4 trillion. The total federal debt is $10.7 trillion, of which one-third is held by foreigners. Because of the real estate decline, households took another hit: At the end of the third quarter in 2007, housing values totaled $21 trillion and mortgages $10 trillion for a net of $11 trillion. At the end of the third quarter in 2010, the net (housing values minus mortgages) had fallen to about $6 trillion. The numbers are easy to remember: Two-thirds of Americans are overweight, one-third of Americans, or approximately 100 million, are obese. The vast majority of obese Americans got that way by eating too much and not exercising. Only a few South Pacific islands compare with the obesity rate in the U.S.
U.S. banks nearly collapsed. That resulted in a global panic and a $36 trillion stock market loss. That capital loss caused a drop of expenditures worldwide, and the global recession was upon us. Who engineered the banking collapse? Financial institutions trading one of their creations -- asset-backed securities. Will the new financial reform bill protect us from this happening again? As I have written, it will not. And the same people who got us into this mess are still in charge of U.S. financial institutions and making inordinate amounts of money. And this gets me to a related point -- paying people too much. No other country in the world matches the U.S. in what it pays CEOs. Here I am not talking about people with good ideas, like Steve Jobs. I am talking about the heads of large corporations -- the chief "bureaucrats." Take a look at the following table. Should anyone get paid these sums for one year of work? Constitutionally, the U.S. is a republic, a representational democracy. But do the people rule? No. In the U.S., it does not matter much whether Bush or Obama is president, or whether the U.S. Congress is primarily Republican or Democrat. Unlike China, a dictatorship where the Communist Party wants to please the people, elected U.S. officials do what special interest groups want them to do. Table 3 provides data on these special interest groups. There were 13,644 registered lobbyists in 2008, and lobbying expenses were $3.3 billion. Political action committees spent $412 million to get people elected. 527 groups are tax-exempt organizations that engage in political activities, and they spent another $238 million. Consider now each of the topics covered above and the special interests. Health lobbying prevented a new bill that puts citizens' interests first from being enacted. Why does the new financial reform legislation not insure a banking meltdown will not happen again? Because the finance sector spent $520 million to get the bill it wanted. Why is the U.S. still so energy dependent? Probably the $400 million-plus spent by the oil companies had something to do with it. Obesity is in part the result of poor people buying starches subsidized by the government -- the agribusiness lobby keeps those starch subsidies in place. Not dealing effectively with illegal immigrants? U.S. business likes things as they are. "For the past several decades, and especially since the Six-Day War in 1967, the centrepiece of U.S. Middle Eastern policy has been its relationship with Israel. The combination of unwavering support for Israel and the related effort to spread 'democracy' throughout the region has inflamed Arab and Islamic opinion and jeopardized not only U.S. security but that of much of the rest of the world. This situation has no equal in American political history ... the thrust of U.S. policy in the region derives almost entirely from domestic politics, and especially the activities of the 'Israel Lobby.' Other special-interest groups have managed to skew foreign policy, but no lobby has managed to divert it as far from what the national interest would suggest, while simultaneously convincing Americans that U.S. interests and those of the other country -- in this case, Israel -- are essentially identical." But the U.S. proclivity for war is troubling and is supported by $163 million from Defense contractors. Eisenhower warns us in the "Military-Industrial Complex" speech. The country finds itself constantly at war. New presidents inherit the wars of their predecessors. They are faced not with deciding to go to war, but whether to accept defeat in one already in progress. And slowly, the great power declines from the inside out. The wars are costly, running up national debts. Vital investments are put off. Schools decline. Sewers leak. For a long time, circuses distract from the spreading ruin. Other societies become productive centers, capturing the new industries. Some begin providing better education for their citizens, better support for their citizens. Their taxes, not drained by the cost of wars past and present, can be devoted to what we used to call "domestic improvements." South Waziristan, Yemen, Somalia, Kosovo, the Taiwan straits, the North Korean border, the seven seas -- we can do this. But the result is that we are continually at war. And the wars cost -- in money, in lives, in attention. And inevitably, domestic priorities, as well as emerging security threats that have no military answers, get ignored. A rich country, Adam Smith wrote, has a lot of ruin in it. We seem intent on testing the limits of that proposition. Is the sun setting on the U.S. Empire? Probably. Worse things could happen. And remember, I said it does not matter much whether Bush or Obama is President.